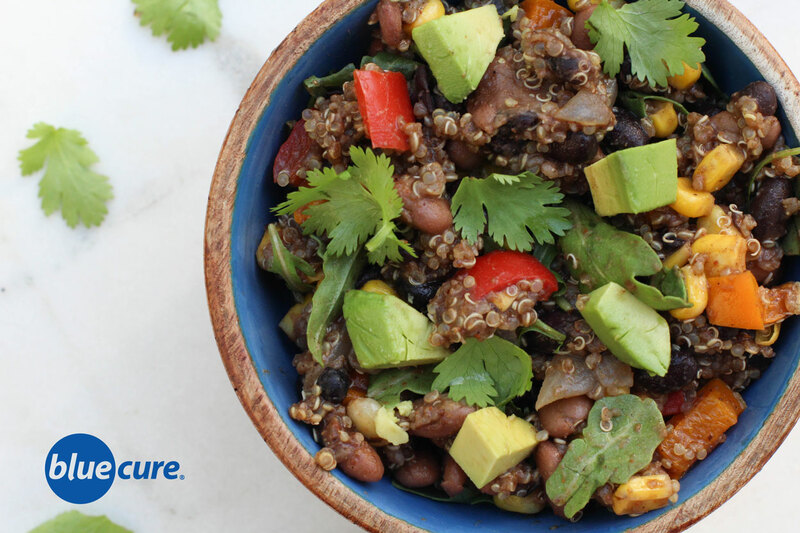 This Mexican black bean quinoa salad is quick, easy, delicious—and versatile! Enjoy it as is, or use it as a filling in corn tortillas or a topping on a big green leafy salad. Toss in some fresh mango or roasted sweet potatoes to sweeten it up! Black beans and quinoa are both good sources of plant-based protein! A cup of black beans are packed with 15 grams of protein, while a cup of cooked quinoa provides 8 grams of protein. A 1/4 of this quinoa salad provides ~19 grams of protein per serving, as well as ~21 grams of fiber from all the delicious plants! While eating enough protein is important, most Americans are getting more than enough— and are actually not getting enough fiber! So load up the plant-based proteins that are also packed with fiber! Rinse the quinoa well. Combine 1 cup water with ½ cup of quinoa. Bring to a boil, then reduce the heat and cover. Let the quinoa cook for about 15 minutes or until the water steams off and the quinoa is fluffy. Wash and chop the veggies. Saute the onions with 1-2 tablespoons of water. Then add in the bell peppers. Stir in the spices. Continue to saute until the veggies are tender, then add in the corn, greens, tomatoes, and black beans. Adjust the spices to taste. In a bowl, combine the veggies and bean mix with the quinoa. Top with juice from one lemon or lime, black pepper, and fresh cilantro. Serve with sliced or diced avocado. Enjoy on its own or serve in corn tortillas or a bed of arugula.